Aki Kaurismäki's direction debut already displays the black humour, the laconic hopelessness of his later work. Here the murderer is the law student Rahikainen. He forces his way into the flat of an elderly man named Honkanen and shoots him. Although he is watched at the scene of the crime by young Eeva, her description is of no use to the police. 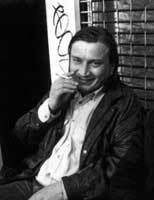 One of the killer's friends (Kaurismäki's protagonist, the late Matti Pellonpää) gets suspicious but doesn't investigate the case further. Finally the police gets to Rahikainen: His fiancee had been killed in an accident supposedly caused by Honkanen. Rahikainen is interrogated. He has no alibi, but Eeva who is there to identify him, denies that he is the man she saw at the scene of the crime. Later, a drunk makes a surprising confession. The inspector knows that it is false but is sure that sooner or later feelings of guilt will drive the real culprit into the arms of the police.